Camping is a great way to enjoy Mother Nature and all her beauty. While you want to experience the outdoors, you don’t need to spend your nights in the freezing cold. Even summertime camping can get uncomfortably cold. If you’re looking to heat your tent without using electricity, several options are available. But there are also some important risk factors you’ll want to be aware of. Here’s what you need to know about keeping your tent warm and cozy without having access to electricity. Tents are typically made from canvas, nylon, felt or polyester. These materials are often treated with waterproof chemicals. Unfortunately, they are usually not particularly resistant to fire. Never use an open flame heating element inside a tent. This includes wood, charcoal and propane or other gas based barbecues and heaters. Not only can they easily catch the tent on fire, they can also cause build-up of dangerous carbon monoxide inside. Colorless and odorless, carbon monoxide can easily kill sleeping campers. Tent ventilation plays a key role in staying warm. Many times people will try to pull the tent tight, close all windows and vents. Realistically most tents are made from nylon or a similar material and pulling them tight isn’t going to really conserve much heat. Keeping some ventilation while it might sound counter-intuitive. Body heat and breath cause condensation to build up inside the tent, this condensation, which forms on the tent walls, makes the interior damp and the dampness will cause you to feel cold. However, proper ventilation prevents condensation build-up, helping keep the inside of the tent and your sleeping gear dry (and therefore help keep you warm). Boost your body heat by wearing warm clothing when you’re going to bed. Now, this doesn’t mean you have to sleep in a winter coat and scarf. Instead, you can stay comfortable and warm by wearing long underwear, thick socks, a shirt and a knit cap. Just a few additional garments can keep you appropriated toasty even in frigid temps. Packing just a few simple items can help you stay warm. Hand warmers are rectangular, single-use packs which act as a comfortable, temporary heat source. While designed for your hands, they are actually perfectly safe to place in your sleeping bag, or in your footwear if your feet get cold (caution do not place they directly against your skin if you have sensitive skin). A hot water bottle is another safe and effective option. Simply fill the bottle with boiling water and place it in the bottom of the sleeping bag. Be sure you have a Nalgene or other water bottom that has a very secure lid that will not accidentally open. With hot water bottles the heat will radiate throughout the bag and help keep you warm for a decent length of time. Eating a calorie rich meal before bed can help your body stay warm during the night. However, timing is key here. To limit stomach discomfort, and potential trouble falling asleep the meal should be calorie rich, but not calorie dense where you feel stuffed which will prevent you from falling asleep. For best results eat something about a half hour before bed time. Outside of the supplemental heat sources listed above you can use propane space heaters. Propane space heaters are considered and effective, relatively safe way to heat a tent, the heaters are powered by propane that is stored within a tank of various sizes. Again it is important to stress these are to be used in a ventilated area, it should not be used in something that is fairly air tight. Heat is measured in BTUs, which stands for British Thermal Units. It’s the amount of heat required to raise the temperature of a pound of water by one degree Fahrenheit. You will want to calculate the number of BTUs needed to heat your tent. If the heater isn’t strong enough, the tent will not warm up to a reasonable temperature. But if the theater is too strong, your tent could be uncomfortably hot. Plus, as we will detail below, a heater which is too large for your tent could be a serious safety hazard. To calculate the appropriate level of BTUs, you will first need to know the cubic feet of the inside of the tent. Cubic feet is measured by multiplying length, width and height or you can also use the BTU calculator here. Next, you will take the average outside temperature and subtract the desired inside temperature. The resulting number is the temperature increase. Now you will multiply the three numbers: total cubic feet, temperature increase and the number .133. The result is the required number of BTUs necessary to maintain the desired internal temperatures. Portable, versatile and with plenty of safety features, the Mr. Heater brand heaters are a great choice for camping. This specific one features four-position control with built in Piezo igniter for accurate and precise temperature control. Heat settings can be switched between 4,000 and 9,000 BTU and hour. With the lower setting is great to help conserve propane. As with any heat source you bring into your tent, safety is the number one concern. Fortunately, Mr. Heater will automatically shut off if the unit is tipped over or if low-oxygen levels are detected. The unit also includes a high temperature wire guard on the front to help keep items from coming into direct contact with the front of the unit. Lastly, the heater is easy to transport. It has a fold down handle that makes storing the unit easy, while not tiny it is easy enough to bring along to a drive up campsite. As the name implies, this is a smaller, more portable version of the Mr. Heater unit. Designed to be able to operate indoors, it can heat rooms up to 95 square feet. This is also ideal if you have an additional heat source and use this to supplement it. Operation is simple with a one-button on/off switch. Safety features include auto shutoff should to unit tip or detect a low oxygen environment. The unit operates off of a one pound disposable propane cylinder. This portable heater is specifically designed for outdoor activities such as camping, fishing, field work and more. A double-burner design burns fuel efficiently and provides about three and a half hours of heat from a 230g tank. The aluminum allow reflector design conducts heat while resisting dents and other damage. An adjustable air inlet allows for a safe and efficient operation at a wide range of altitudes. Propane space heaters are safe to use, but you will want a thorough understanding of potential dangers. These safety issues are extremely important to understand. 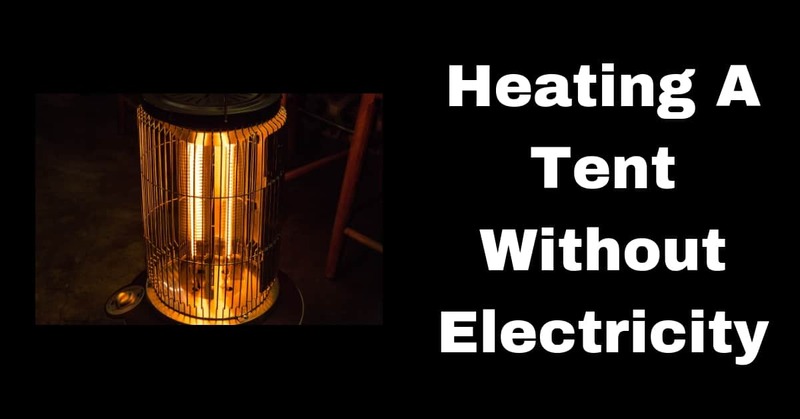 When a space heater is running, it consumes oxygen in the air. As the oxygen is used up, it’s replaced by carbon monoxide. If this occurs in a tent, the people inside can become dizzy, confused and will eventually pass out. If too much time passes without fresh air, death can occur! Follow the instructions above for determining the correct number of BTIs for the size of your tent. Avoid using a heater which is too powerful for the size of the tent. Also, make sure the tent is adequately ventilated. Keep fabric, paper and other flammable materials away from the space heater. While you can keep the heater in a corner of the tent, make sure it’s not pressed up against any of the sides directly. Instead, you’ll want as much airflow as possible around the entire unit. Follow assembly and operations instructions exactly. When the unit is operating safely, there should be no smell. However, if the heater develops a leak, you’ll smell a strong odor which resembles rotten eggs or a skunk. You might also hear a hissing noise near the fittings. If any signs of a leak appear, you’ll want to turn off the space heater immediately. Also, exit the tent right away for fresher air. A leaking propane tank can be very dangerous so don’t attempt to fix the problem yourself. Never store a propane tank indoors. Instead, they should only be stored outdoors, at least 10 feet away from anything flammable. Store tanks in an upright position. You’ll also want to use a bungee cord or similar fastener to keep the tank secured. Have your tank professionally checked if you plan to store it for an extended period of time. All tanks which are at least 10 years old should also be checked out, even if they seem to work fine. Heating your tent doesn’t require electricity. Usually the best ways to stay warm are the simplest. Extra layers of clothing, hand warmers and a hot water bottle will all help keep you comfy when sleeping outdoors in a tent. Plus, all of these methods post almost no safety risk whatsoever. Propane-powered space heaters are another effective option. But there can be serious risks you need to be aware of. Make sure the heater is the appropriate size for your tent. Also, keep all flammable materials far away from the heater. Camping doesn’t have to be uncomfortable. By following the tips above, you’ll be able to keep your tent toasty no matter how low the outside temperature drops.